Reply With Templates - replying repetitive Microsoft Outlook email messages using email templates. This update includes some functional improvement of support for the latest Outlook editions. Several other problems are fixed as well. "Personalization" variables were not retrieved correctly in some cases with contacts from Exchange Address Book. Incorrect e-mail signature would be applied in some use case scenarios when non-default e-mail account was selected for sending e-mail. Template marked as favorite would disappear from the general list of templates. The icon would not show the "replied" or "forwarded" status in some cases on the e-mail message when using templates while replying or forwarding to that e-mail. Template marked as default would appear in Outlook To-Do list on Outlook 2007 and 2010. To avoid that, the default template on these Outlook versions is not flagged now. Outlook 2007 was crashing in some cases when trying to import templates from file folder with a number of sub-folders within. Support of Windows 7 and Outlook 2010.The Product was tested on Windows 7 and updated to support Outlook 2010 already. 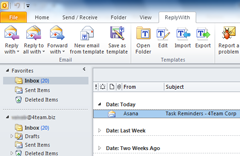 A new separate tab now appears in Outlook 2010. Support for Outlook 2007 and Windows Vista added.